This page is about the city in Ohio. 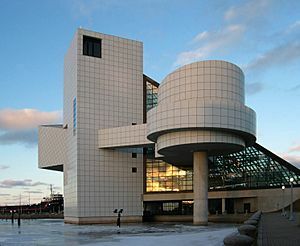 For the metropolitan area, see Greater Cleveland. 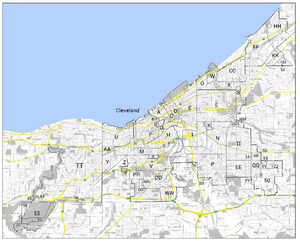 For other uses, see Cleveland (disambiguation). 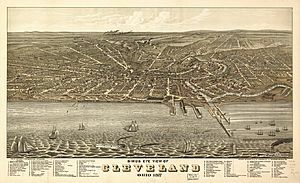 Cleveland (/ˈkliːvlənd/ KLEEV-lənd) is a city in the U.S. state of Ohio and the county seat of Cuyahoga County, the state's most populous county. 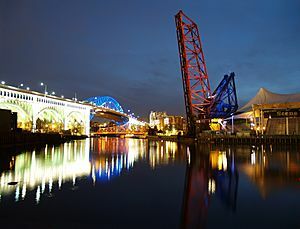 The city proper has a population of 388,072, making Cleveland the 51st largest city in the United States, and the second-largest city in Ohio after Columbus. 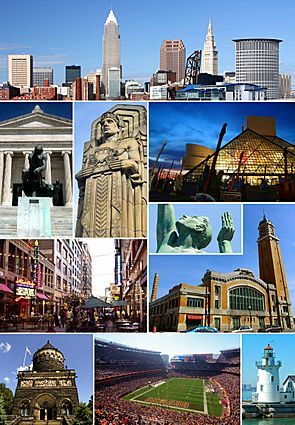 Greater Cleveland ranked as the 31st largest metropolitan area in the United States, and second largest in Ohio with 2,060,810 people in 2015. In the 1950s and 1960s, social and racial unrest occurred in Cleveland, resulting in the Hough Riots from July 18 to 23, 1966 and the Glenville Shootout from July 23 to 25, 1968. In November 1967, Cleveland became the first major American city to elect a black mayor, Carl Stokes (who served from 1968 to 1971). Anger at this in other parts of the country swung opinions of the city to the negative side. 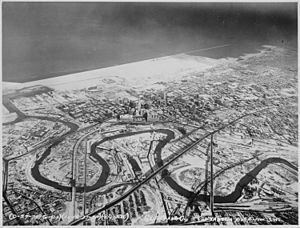 According to the United States Census Bureau, the city has a total area of 82.47 square miles (213.60 km2), of which 77.70 square miles (201.24 km2) is land and 4.77 square miles (12.35 km2) is water. The shore of Lake Erie is 569 feet (173 m) above sea level; however, the city lies on a series of irregular bluffs lying roughly perpendicular to the lake. In Cleveland these bluffs are cut principally by the Cuyahoga River, Big Creek, and Euclid Creek. The land rises quickly from the lakeshore. Public Square, less than one mile (1.6 km) inland, sits at an elevation of 650 feet (198 m), and Hopkins Airport, 5 miles (8 km) inland from the lake, is at an elevation of 791 feet (241 m). 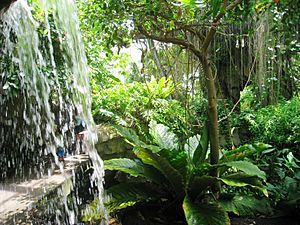 The all-time record high in Cleveland of 104 °F (40 °C) was established on June 25, 1988, and the all-time record low of −20 °F (−29 °C) was set on January 19, 1994. 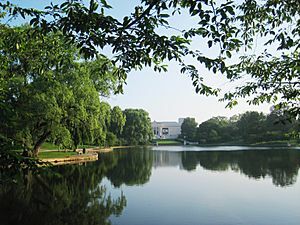 On average, July is the warmest month with a mean temperature of 73.5 °F (23.1 °C), and January, with a mean temperature of 28.1 °F (−2.2 °C), is the coldest. Normal yearly precipitation based on the 30-year average from 1981 to 2010 is 39.1 inches (990 mm). The least precipitation occurs on the western side and directly along the lake, and the most occurs in the eastern suburbs. Parts of Geauga County to the east receive over 44 inches (1,100 mm) of liquid precipitation annually. Frequent thunderstorms are also common in Cleveland especially during spring and early summer. As of the census of 2010, there were 396,815 people, 167,490 households, and 89,821 families residing in the city. The population density was 5,107.0 inhabitants per square mile (1,971.8/km2). There were 207,536 housing units at an average density of 2,671.0 per square mile (1,031.3/km2). The racial makeup of the city was 53.3% African American, 37.3% White, 0.3% Native American, 1.8% Asian, 4.4% from other races, and 2.8% from two or more races. Hispanic or Latino of any race were 10.0% of the population. As of 2010[update], 88.4% (337,658) of Cleveland residents age 5 and older spoke English at home as a primary language, while 7.1% (27,262) spoke Spanish, 0.6% (2,200) Arabic, and 0.5% (1,960) Chinese. In addition 0.9% (3,364) spoke a Slavic language (1,279 - Polish, 679 Serbo-Croatian, and 485 Russian). In total, 11.6% (44,148) of Cleveland's population age 5 and older spoke another language other than English. 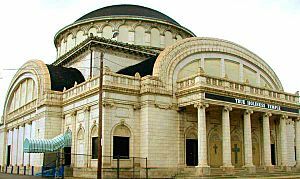 The city also has a history of polka music being popular both past and present, even having a subgenre called Cleveland-style polka named after the city, and is home to the Polka Hall of Fame. This is due in part to the success of Frankie Yankovic who was a Cleveland native and was considered the America's Polka King and the square at the intersection of Waterloo Rd. 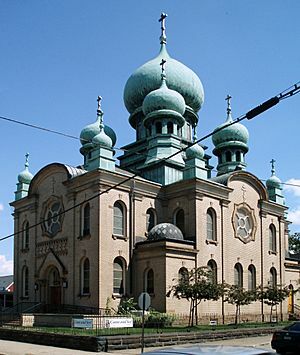 and East 152nd St. in Cleveland (), not far from where Yankovic grew up, was named in his honor. The national food press—including publications Gourmet and Esquire —has heaped praise on several Cleveland spots for awards including 'best new restaurant', 'best steakhouse', 'best farm-to-table programs' and 'great new neighborhood eateries'. 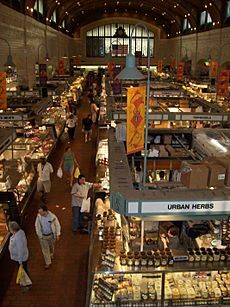 In early 2008, the Chicago Tribune ran a feature article in its 'Travel' section proclaiming Cleveland, America's "hot new dining city". Cleveland Facts for Kids. Kiddle Encyclopedia.